Sandford is a little village twelve kilometers from Yarmouth. 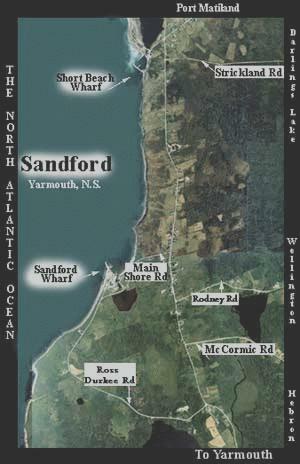 Sandford has been a popular fishing spot for the last hundred years, being active in many areas including herring fishing, groundfishery, lobstering, and most recenly a local fishing vessel has begun crabbing. However, there has long been an attraction in this little village that draws people from all over the world. This little thing is called the Sandford Drawbridge. This was first built in the early 1915's and was originally just a closed bridge under which boats could go at high tide to be sheltered from the wind during storms, and when work had to be done to the hulls of any boats. It was used in this manner for many years up until a need was seen for more room in the harbour. So a causeway was built and this removed the bridge from the main road. It was moved to a point where it connected the two sides of the causeway. At this time the bridge began to be raised and lowered as needed. See the picture below. The bridge stayed in that spot for about twenty years, but in the year 1956 there was so much boat traffic in the harbour that the drawbridge had to be raised and lowered much too often. When the bridge was due to be rebuilt, it was decided to locate it where it would be out of the main water traffic, but still close by and still in use. This had the added advantage that the cables and guide-lines would be away from so much saltwater contact and would not rust out. The bridge is still being used almost every day since the day it was built. There has been a steady flow of traffic over this small bridge for many years. Since it was moved to its present spot, the boats only have to raise it to go furthur into the sheltered cove to do work or weather out a storm. Thus,since in 1984 the bridge was moved, most fishermen believe it is in a better spot. A number of companies, including the Grand Hotel and the Manor Inn in Yarmouth, have tour buses which will make a stop at the Sandford Drawbridge and will relate the history of the smallest working drawbridge in the world. Ths bridge is built using creosoted logs for the base, and the superstructure is made of pentox-treated lumber to prevent rotting in the salty air. That are one-inch thick steel cables used in the pulley system which raises and lowers the bridge, but other than that there are no special devices required to make the bridge any better. If you wish to go out on a fishing trip, a local fisherman will take you deep-sea fishing using two methods. One is to use the old-fashioned handline, and the other method now popular in Nova Scotia is using a rod and reel. The second method is more challenging, especially if you hook any of the many types of ground fish around such as cod, pollack, haddock and sometimes even a halibut. There are many activities to entertain all ages, including going for a long walk on the beautiful beach, having a swim, and even watching fish being unloaded and processed at the fish/lobster plant named Joel Smith Fisheries. Fish is filleted and shipped in ice from this plant during the summer months, and by chance if you are here in the winter then you can watch fresh lobster being prepared to enter a lobster pound, or you can even purchase some live lobster right out of the water for a fraction of the cost at the supermarket. You should be aware, however, that there is a legal season for this area, from the last working Monday in November untill the last day of May. Througout the year you would be able to see fishermen repairing their gear, especially if you are around in early September when the gear is being overhauled. During this time you can see ropes and tackle being prepared, lobster pots repaired, and buoys being painted. There's no chance for a visitor to be bored if you enjoy walking, taking photos, painting an unforgettable scene, and in late October seeing lobster bait being prepared in barrels of salt for later use. A big welcome awaits you at Sandford. World's Smallest Draw Bridge: Sandford Nova Scotia - YouTube The drawbridge located at the Sandford wharf in Yarmouth & Acadian Shores is the smallest drawbridge in .